Nigeria and South Africa will resume their rivalry once again as the qualifiers for the 2019 Africa Cup of Nations kick-off this weekend across the continent. The Super Eagles h ave been a bogey team of sorts for Bafana Bafana, who have never beaten Nigeria at senior level in a competitive game. 89′ SA close to getting a third. Lebogang Manyama’s effort goes over. 85′ Nigeria 0-2 South Africa. SA make a change. Keagan Dolly off, Tiyani Mabunda on. 81′ Goal! Nigeria 0-2 South Africa. Percy Tau rounds Akpeyi, passes into the net. 75′ Ndidi sets himself up, right to left foot. He fires his shot over. 70′ Bafana Bafana Come close again but the post, just like in the first half, comes to Super Eagles rescue. 54′ Goal! Nigeria 0-1 South Africa. Tokelo Rantie gives South Africa the lead. 42′ South Africa chance! Zwane’s strike off the woodwork after defensive howler by Akpeyi & Awazie. 38′ Nigeria chance! Khune tips over Moses Simon’s effort. 35′ Goal-saving interception by Hlatshwayo to stop Onazi’s pass from reaching Iheanacho. 30′ The Super Eagles have totally dominated the Bafana Bafana. Lovely interchange of passes, good build ups and organised at the back. 22′ Nigeria chance! Etebo turns the ball agonizingly off target from Iheanacho’s pass. 21′ Iheanacho slipped through on goal, SA keeper Khune off his line to clear. 14′ Iwobi loses the ball and South Africa launch an attack. Ekong does well to clear for a corner kick. 11′ Ndidi’s left-footed attempt for Nigeria goes over. 0′ Game on in Uyo. Nigeria 0-0 South Africa. 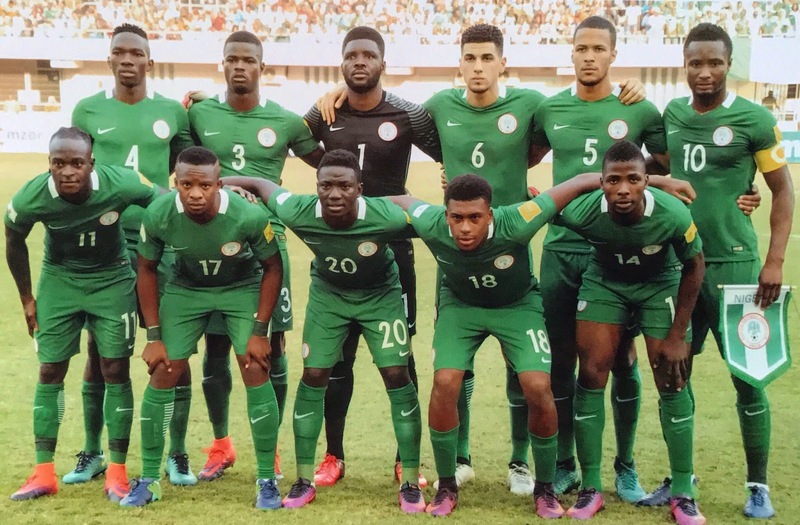 Nigeria: Akpeyi, Shehu, Awaziem, Troost-Ekong, Echiejile, Etebo, Onazi, Ndidi, Iwobi, Iheanacho, Simon. South Africa: Itumeleng Khune, Rama Mphahlele, Erick Mathoho, Thulani Hlatshwayo (c), Tebogo Langerman, Themba Zwane, Dean Furman, Bongani Zungu, Keagan Dolly, Sibusiso Vilakazi, Tokelo Rantie. The Super Eagles have been a bogey team of sorts for Bafana Bafana, who have never beaten Nigeria at senior level in a competitive game. A Tokelo Rantie brace, the last time the two sides met in Uyo-the same venue for Saturday’s game, nearly gave South Africa the first win over Nigeria until Sone Aluko’s brace put paid to that dream. The carpet will be laid again at the Godswill Akpabio Stadium as the Super Eagles, just like their South African counterparts, look to get back into Africa’s showpiece football event. Nigeria has missed the last two editions (2015 in Equatorial Guinea and 2017 in Gabon), an aberration that Rohr and his staff will want to correct. Pitted in group E alongside South Africa, Libya and Seychelles, it looks like an easy run for the Eagles but previous failings will serve as warning bells not to take anything for granted. Nigeria has no lost a game since Rohr took over and were 3-0 winners over Togo in a recent friendly in Paris while South Africa coach Stuart Baxter will make his bow against Nigeria in his second spell as Bafana coach.